Let’s take a deeper look at number talks! 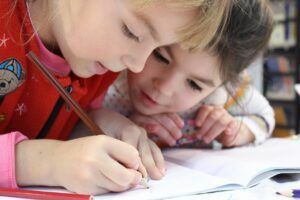 As teachers, even the best of us can sometimes find ourselves in a stagnant pattern of standing at the front of the classroom dictating that number talk. This “sage on the stage” method doesn’t really mesh when we’re thinking about creating a math culture in our classrooms. 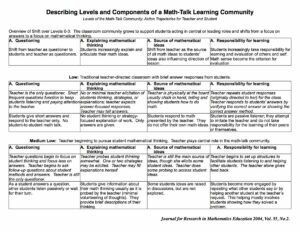 As you take a snapshot of math in your classroom, and number talks in particular, you might find that, while your classroom definitely trends towards student-led, you are still the one owning the marker at the front of the class doing the recording of students’ thoughts during those number talks. One of our goals for project schools, and for this blog today, is to help move number talks away from “teacher at the front” to “student to student” talk. Of course, when we’re talking about the car method vs the airplane method, kids are able construct a viable argument for their method of solving the problem, but critiquing others’ reasoning (in a polite way!) isn’t really a dialogue. Do we ever facilitate pure student-to-student number talk, where kids are politely engaging in conversation about math? Download the free Number Talk Resources from our store! You divide the students into pairs and have them choose who will be Partner A and who will be Partner B. Post the problem on the board and tell the students that the first person to solve will be Partner A. Partner B will have a dry erase board and a marker and technically play the role of “teacher,” doing the things you usually do during a number talk: give kids wait time, wait for kids to have thumbs on their heart, do an answer collection, etc.. Once Partner A has solved the problem, they will tell Partner B what the answer is, and Partner B will write the answer on the dry erase board (serving as the recorder). Partner A will explain to Partner B how they solved the problem. During that time, Partner A is the only one who can talk and Partner B is writing on the dry erase board and recording Partner A’s thoughts. Partner A says, “I thought of these two numbers – 194 plus 26. I decided to bump up 194 to 200, and add the 200 to the 20 to make it easier because I added on the six, I had to take away the six.” They may even say they used the strategy of compensation! Partner B’s job is to record based on EXACTLY what Partner A is saying without adding in their own thoughts or “autocorrecting” what they’re hearing. Since Partner B is filling the role of the teacher, we want to try to help Partner B be a leader within their pair. They can ask clarifying questions to help prompt Partner A – “What did you mean here? Did you mean you decomposed the number?” But they can only write what Partner A is saying on the dry erase board. Partner B would then give the dry erase board to Partner A and then Partner B would describe another way to solve it. Then Partner B would demonstrate how they solved it and the partners would have a conversation about it. The next step is for Partner B to come up with a different way to solve the problem. They might still use the same strategy (decomposing, for example), but they could to use a different addend. Or they might still use compensation, but they would have to compensate in a different way. Or they might use a totally different strategy like the traditional or partial sums, or if it’s subtraction, an open number line. The strategy doesn’t matter as much as the fact that we’re helping kids have conversations and learn the fine art of critique. Then, the next time around, the math buddies can start off the number talks the other way around where Partner B gets to be the first person to respond to the number talk the teachers has posted, and Partner A will record. If you wanted to focus on more of a strategy talk, you could assign one or two strategies, letting students decide to solve the problem one of two ways. Whichever way the first partner chooses to solve the problem, the other partner has to solve it using the other strategy. In the previous blog, we talked about building students’ strategy knowledges, so if kids knew how to solve it and knew the names of the strategies, you might say something like, “In this problem, I want you to focus in on the strategy of D.C. that we talked about last week. And since a lot of us are really great at them, we’ll also use partial sums. Those are the two strategies we’ll use.” This kind of prompt is helpful if the kids are struggling in partner number talks. So often, students can’t think outside of what the other partner has thought of, and they might not be able to remember that menu of strategies they can use. It can be scary or intimidating to give up your control during a number talk, but as you encourage students to take ownership of their own learning through partner number talks, they’ll develop a deeper, more firm foundation of strategies for solving problems that they’ll be able to apply in every subsequent grade. Download our Number Talk Resources free from our store!